Helmet of a Joseon Dynasty "Marshal", if you notice carefully at the center front of the visor is the Chinese character for Yuan Shuai(Marshal). Late Dae Han Empire military uniforms, from 1895 to 1910, notice the rank insignias are on epaulettes and/or on sleeve. The sleeve insignias are very similar to French Napoloenic era Hussars. Shoulder strap from Dae Han Empire. These shoulder straps was used somewhere from 1900-1907, this is a pair of shoulder strap for the rank of Lieutenant . Various South Korean army uniforms from late 50's to mid-80's. Rank insignia for officers during the Korean war. 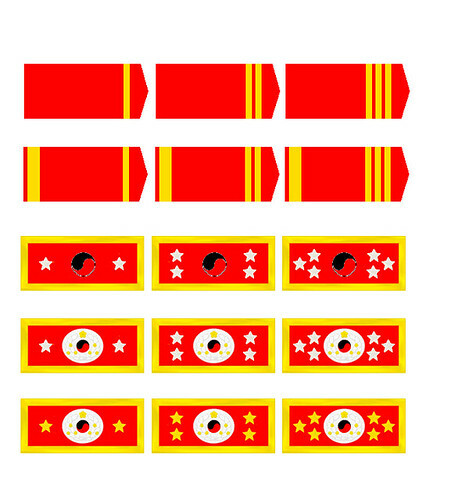 Rank insignia for other ranks during the Korean war. All pictures taken from the Korea Army Museum website. During the late 19th century, the Chinese, Korean & Japanese empires revamped their military system by Prussian style, but followed the French rank insignias. After the second world war somewhere around the 60's to 70's, Taiwan, South Korea & Japan followed the US style system & rank insignia. Thanks, I've been looking for the Korean war rank insignia for a long time. I knew that the metal bars were worn on field hats from some old movies, but never seen a closeup picture like this. Can you post some more pictures of uniforms and insignia of that period? or any information about that design? Frank, the pics went AWOL for four years. Did you saved the rank insignia? I didn't see attached your picture of korean military items. So, I knew that korean milatary rank than open on online. Korean rank and insignia is more various than offcial open data. 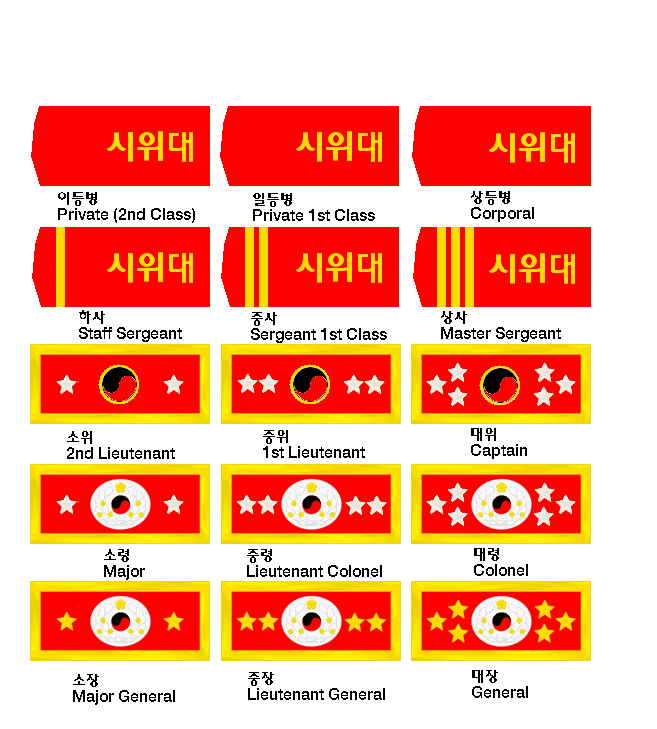 Let me know If you need more detail data for korean military rank and insignia. I tried to reconstruct the rank insignias, but are these correct? I found out that I am incorrect. epauletts for army full dress.